This group personal fitness program is for women of ALL ages who want to take control of their body and life and make strength training a priority! 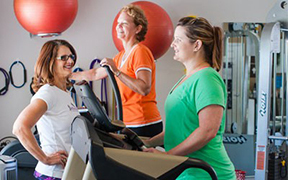 Under the supervision of Certified Personal Trainer Cindy Treaster, participants of RWL receive an individualized progressive training program based on their needs. RWL sessions run six (6) weeks and offer 2-day, 3-day and 4-day Strength Training Sessions. Not just for beginners, intermediate and advanced training sessions are available that will add variety to your workout. RWL’s sparkling clean, state-of-the-art studio is conveniently located on Anastasia Blvd., close to downtown and the beaches.